New From DeLuca ink. 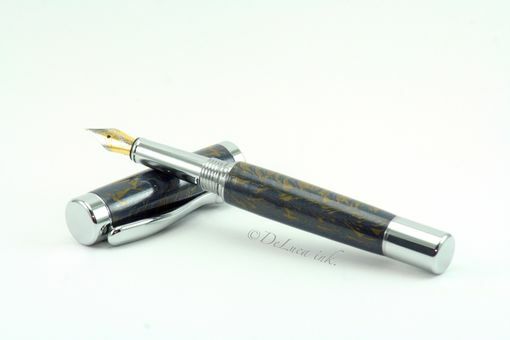 comes this unique metal composite fountain pen. Pictured instrument made from M3 Lapis, it features smokey blues wrapped in pristine brass swirls. What is M3? M3, short for Macro-Molecular Materials are part of the new breed of new age designer materials that make everything from the Stealth Bomber to the International Space Station possible. These materials are made with high purity metals and other exotic elements that have been deconstructed to the macro-molecular level, homogenously combined and then reconstructed with highly refined proprietary chemical binders. Because the molecules are distributed homogenously through a process known as the Micelle Phenomenon, the new material gains the benefit of all the unique characteristics of the individual components. This process allows for beautiful random wood grain patterns and metal combinations that were never before possible. Deep, dimensional, mirror finishes with galactic star field qualities make for a surface that is mesmerizing and desirable. Expect all M3 instruments to patina over time like any metal surface. 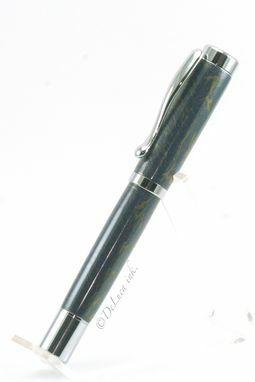 Pictured Writing Instrument in Lapis and Brass is available for purchase immediately or we would be happy to custom create a one of a kind instrument for you out of the listed materials above! 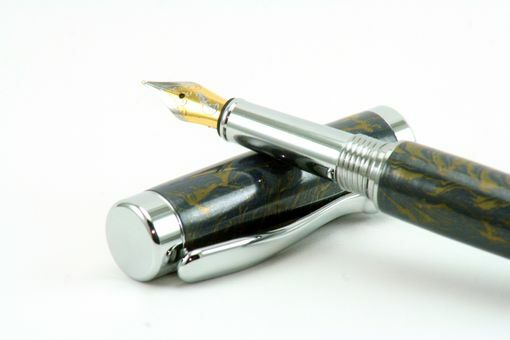 Dimensions: Pictured Writing Instrument is available for purchase.